Open Bus Ticket is a ticket which you can use to travel along Vietnam, from North to South or from South to North. The first departure place is Hanoi (if you travel from the North) or Ho Chi Minh city (if you travel from the South). When you book Open Bus Ticket, at the biggining, you have to choose how many places in the list that you would like to stop. Once you have chosen and paid for the Open Bus Ticket, you cant change it on the way you travel (sometimes, you can deal with staff of the Open Bus company but you will have to pay some extra). It is one month available counts from the day you depart at the first place. Have the ticket in hands, after leaving first place, you can stay how long you want in the next destination. As soon as possible (Vietnam Local Bus recommend you to confirm at least one day in advace), you have to go to bus office or call them to confirm your next departure date so that you will have available seat/ bed on the bus. You also can check with the bus staff if they can come to your hotel to pick you up. If they can, then you should be sure about picking up time to prepare yourself. Open Bus Ticket availablity is one month, starts from the first departure date that you book. All Open Bus companies have an office in every stop where you need to go to make confirmation. Their offices are in the center of every city which is very easy to reach. The address, telephone number of bus offices in each stop are clearly showed on your ticket. You can call them in offical hour to get support in needed. As other bus tickets, Vietnam Local Bus provides pick up services in any hotels in Hanoi Old Quarter and some backpackers area in Ho Chi Minh City. Please contact us to know if we can pick you up from your accommodation. The Open Bus Ticket is like a small note book which contents 10 pages. Each page with 2 copies (one you will keep and the other for bus company collects before you go to the next destination) is a ticket for one stop. NOTE: Because it is a long journey with a lot of stops on your way. You have to confirm the bus ticket and departure date, time... by yourself with the Open Bus Company to be sure your travel goes smoothly. Vietnam Local Bus only has full responsibility to confirm, clearify of pick up time, pick up point... on the first departure place. All later ones, you will have to do it on your own. We don't accept any complaints of fully bus makes you not be able to go as your travel plan. Open Bus Ticket is only used for the stops that you listed when you first booked it. If you want to add more stops, you need to contact us or come to Open Bus office in that city to check if it is possible or not. Open Bus Ticket is only used for 1 way, it will be a separate ticket if you would like to book a return trip. - Ninh Binh is the province of Viet Nam where is located in south of Hanoi capital. The distance from Hanoi to Ninh Binh is about 120 km which takes you about 2 hours riding with amazing view on it's way. Getting to Ninh Binh , you can do a lot of interesting activities: Visit a lot of highlights in Ninh Binh such as: Hoa Lu – Tam Coc, BaiDinh – Trang An, Van Long – Kenh Ga and Dancing cave which are attractive all travelers on the world. - Phong Nha is a national park and UNESCO World Heritage Site in the Bo Trach district of Quang Binh province which is far from Hanoi about 500km. - Hue is the capital of Viet Nam from Nguyen Dynasty, which is well known for its historic monuments, which have earned it a place in UNESCO's World Heritage Sites. - Da Nang is the biggest city in center of Vietnam where has so many beautiful beaches and sightseeing which is attractive tourist people to come. - Hoi An is the city of Quang Nam province which is historic district, is recognized as an exceptionally well-preserved example of a South-East Asian trading port dating from the 15th to the 19th century. - Nha Trang is a coastal city of Khanh Hoa Province, on the South Central Coast of Vietnam which have a lot of beautiful beaches. - Dat Lat is a city of Lam Dong province which is a popular as a romantic destination in Viet Nam. - Mui Ne is a coastal fishing town in the Binh Thuan Province of Vietnam. - Ho Chi Minh is located in the south of Viet Nam, is the biggest city in Vietnam. The old name of Ho Chi Minh is Saigon. 17.45: Be ready with your luggage, passport before our guide and driver pick you up from your hotel in Hanoi Old Quarter to the bus office to change the ticket and get on the bus around 18.45. 20.30: Arrive in Ninh Binh province, our bus stop here for dinner and who stop at Ninh Binh please check your luggage before you get off the bus and find the hotel. When you know when you want to leave Ninh Binh, you need to go to the same drop off address in Ninh Binh city to confirm your leaving dates, so that the bus officer will book the bed for you. For people who don’t stop in Ninh Binh, just have a break before bus continues the journey. 20.30: Our bus start leaving to the Phong Nha national park from Ninh Binh. 4.00: Arrive at Phong Nha national park, our bus stop here for who stop at Phong Nha, check your luggage before you get off the bus and find the hotel. When you know when you want to leave Phong Nha, you need to go to the same drop off address in Phong Nha city to confirm your leaving dates, so that the bus officer will book the bed for you and inform you the time (4.00 am every morning) you need to be there to wait for the bus. For people who don’t stop in Phong Nha, just have a break before bus continues the journey. For people already confirmed the bus leaving Phong Nha before, you need to be ready here at 4.00 am for the bus leaving to the next stop. 04.00: Our bus start leaving to Hue from Phong Nha national park. - For people stops in Hue, check your luggage before you get off the bus and find the hotel. When you know when you want to leave Hue, you need to go to the same drop off address in Hue city to confirm your leaving dates, so that the bus officer will book the bed for you and inform you the time (8.00 am or 1.00 pm everyday) you need to be there to wait for the bus. - For people who don’t stop in Hue, just have a break before bus continues the journey. - For people already confirmed the bus leaving Hue before, you need to be ready here 15 minutes before 8.00 am or 1.00 pm for the bus leaving to the next stop. - For people stops in Danang, check your luggage before you get off the bus and find the hotel. When you know when you want to leave Danang, you need to go to the same drop off address in Danang city to confirm your leaving dates, so that the bus officer will book the bed for you and inform you the time (16.00 everyday) you need to be there to wait for the bus. - For people who don’t stop in Danang, just have a break before bus continues the journey. - For people already confirmed the bus leaving Danang before, you need to be ready here 15 minutes before 11.00 or 16.00 for the bus leaving to the next stop. 11.00 or 16.00 the bus starts leaving Danang to Hoi An. - For people stops in Hoi An, check your luggage before you get off the bus and find the hotel. When you know when you want to leave Hoi An, you need to go to the same drop off address in Hoi An city to confirm your leaving dates, so that the bus officer will book the bed for you and inform you the time (18.00 everyday) you need to be there to wait for the bus. - For people who don’t stop in Hoi An, just have a break before bus continues the journey. - For people already confirmed the bus leaving Hoi An before, you need to be ready here before 18.00 for the bus leaving to the next stop. Night bus leaving from Hoi An to Nha Trang everyday at 18.00 from the same drop off point in Hoi An central. - For people stops in Nha Trang, check your luggage before you get off the bus and find the hotel. When you know when you want to leave Nha Trang, you need to go to the same drop off address in Nha Trang city to confirm your leaving dates, so that the bus officer will book the bed for you and inform you the time (7.00 am everyday) you need to be there to wait for the bus. - For people who don’t stop in Nha Trang, just have a break before bus continues the journey. - For people stops in Da Lat, check your luggage before you get off the bus and find the hotel. When you know when you want to leave Dalat, you need to go to the same drop off address in Dalat city to confirm your leaving dates, so that the bus officer will book the bed for you and inform you the time (14.00 everyday) you need to be there to wait for the bus. - For people who don’t stop in Dalat, just have a break before bus continues the journey to Ho Chi Minh city. 14.00: Bus driver picks you up at the same drop off point in Da Lat center leaving to Ho Chi Minh city. It takes about 5 hours to get to Ho Chi Minh city. Arrive in the city about 19.00. Journey finishes. 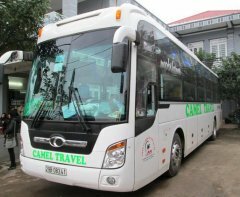 Travellers who stop in Dalat and leaving to Mui Ne, there is bus leaving everyday at 7.30 at the same drop off address in Dalat city in center. It takes 5 hours from Da Lat to Mui Ne. - For people stops in Mui Ne, check your luggage before you get off the bus and find the hotel. When you know when you want to leave Mui Ne, you need to go to the same drop off address in Mui Ne city to confirm your leaving dates, so that the bus officer will book the bed for you and inform you the time (14.00 everyday) you need to be there to wait for the bus. - For people who don’t stop in Mui Ne, just have a break before bus continues the journey to Ho Chi Minh city. - For people already confirmed the bus leaving Mui Ne before, you need to be ready here before 14.00 for the bus leaving to Ho Chi Minh city. 14.00: Bus driver picks you up at the same drop off point in Mui Ne center leaving to Ho Chi Minh city. It takes about 5 hours to get to Ho Chi Minh city. Arrive in the city about 19.00. Journey finishes. Hanoi – Ninh Binh – Dong Hoi city – Phong Nha national park – Hue – Da Nang – Hoi An – Nha Trang – Da Lat – Mui Ne – Ho Chi Minh. Included: Car or taxi pick up from your hotel, open bus ticket. - Get 10% for next booking of our tickets.